Did you know that beloved Disney princess and mermaid Ariel and ultimate fitboy and demigod Hercules share ancestors? They are cousins. How do we figure? Well, settle in for a bit of Greek mythological history. Hercules’s father was Zeus. As most of us know, Zeus was quite infamous for sleeping around with all kinds of lovely ladies (or not so lovely ladies and sometimes not even ladies at all) – producing offspring left, right and center. In the Disneyverse however, he’s happily married to Hera, who is quite a nice lady in this adaptation. Hercules, by the way, is the Roman name of the mythological Disney-hero. In Greek mythology we know this dude as Herakles. All other characters in the Hercules-movie got their Greek names, but Disney might have liked the sound of Hercules better. That’s curious, isn’t it? Well, never mind. In mythology the married and mortal Alkmene bore demi-god Hercules. Zeus was such a player. By the way, Hera wasn’t just the wife of the adulterous grecian thundergod: she was also Zeus’ sister. Lannisters approve, right? Anyway, how is Herc related to the red-haired beauty whose bottom side is all fishy? 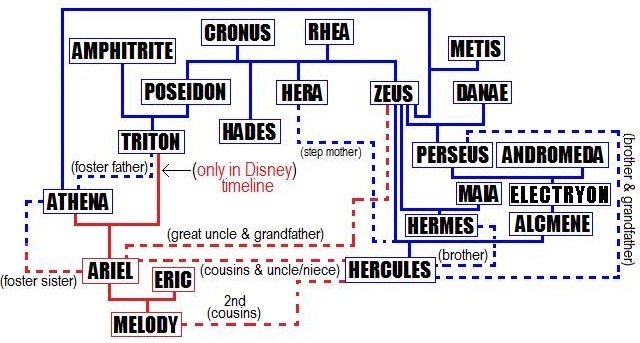 Well, take a look at the family tree of old Zeus. His parents in mythology are the Titans Cronus and Rhea, and his brothers are Hades and Poseidon. Hades rules over the underworld and Poseidon reigns over the seas, leaving Zeus to be the lord of the heavens. Alright, you can already ‘sea’ where we’re going, right? One of Poseidon’s sons is Triton, Ariels short-tempered and kind of racist father. So Hercules and Ariel share a set of ancestors in Cronus and Rhea. There we are. Triton is Hercules’ uncle, which makes Ariel and Hercules cousins. Well, that was easy. A bit of mythological lore, with a little Disney sauce on top, and nobody had to translate any texts from Old Greek. If Pixar movies are interconnected, Disney is going down that road as well. This theory is discussed by The Film Theorists on YouTube.